Cardinals fans can participate by bringing signs to the game, sending tweets that will be shown on TV and sharing photos on Twitter and Instagram (#CardsForTroops). American troops throughout the world will watch the game live on American Forces Network. Coverage begins at 6:30 p.m. CT on FOX Sports Midwest — that’s 2:30 a.m. at USO Camp Buehring, Kuwait. McLaughlin and Rick Horton will call the game, with Jim Hayes and Al Hrabosky in studio and Erica Weston reporting. This One’s For You is presented in coordination with FOX Sports Supports, the Cardinals, Missouri National Guard and American Forces Network. 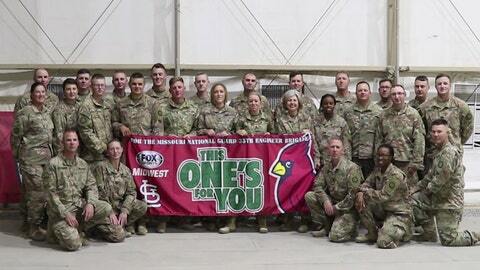 This is the 11th Cardinals telecast to troops. Aug. 15 also is the Cardinals’ second annual Military Appreciation Night. Fans who purchase a special Theme Ticket will receive an exclusive camo Cardinals cap (cardinals.com/militarynight). A portion of each ticket purchased will be donated to USO Missouri. The 35th Engineer Brigade, Missouri Army National Guard, is stationed at Fort Leonard Wood, Mo. The Brigade has a long, proud lineage, originally constituted in 1928. During its 2017-18 deployment, the Brigade’s mission is to conduct general engineering, geospatial engineering, survivability and mobility. Soldiers of the Brigade have completed more than 120 construction missions, 35 survey missions and 80 design projects valued in excess of $75 million.